The Most Important Online Event of the Year! Wealth During These Tumultuous Times! You are invited to join Steve Forbes, CEO and editor of Forbes magazine, in this critical Newsmax online webinar on Thursday, Nov. 5, as he discusses the financial threats as well as solutions during our nation’s turbulent economic times. Joining Steve Forbes — one of the top financial experts in the country — for this revolutionary event will be Newsmax CEO Christopher Ruddy, foreign currency and international finance expert Sean Hyman, and Libertarian vice presidential candidate Wayne Allyn Root. During this special Internet broadcast of the Emergency Dollar Summit, you will learn from Steve Forbes and the panel of esteemed guests how you can act today not only to safeguard your wealth but also to prosper in the face of the perilous state of our economy. The Dangers of a Weak Dollar for America and You! Could the Fed’s Policy Lead America on the Path to Another Devastating Crash? Could We Possibly Suffer a 1930s-Level Depression in the Very Near Future? Could Currency Investing Actually Be the Smartest Play For Protecting Your Wealth in the Face of a Devalued Dollar? Never before has your personal wealth been in such a precarious state as it is today. But if you have a smart game plan, you actually can use today’s dangerous economic climate to profit significantly. This free Newsmax event featuring Steve Forbes is a must-see. PLUS: We’ll give you VIP access to our Emergency Dollar Summit attendee Web site, where you’ll receive exclusive videos and articles aimed at helping you arm yourself with the knowledge necessary to protect your wealth in preparation for this exciting event! Place: It’s an Online Broadcast so you can watch from anywhere! RSVP: Submit your reservation below so we can send you a reminder. If you can’t make the first broadcast, still sign up, as we will send you the times for VIP access to the re-broadcast and encore presentations. Remember: We have a limited number of online spots to watch this program, so sign up today to reserve your spot! This video explains that the demise of the dollar has been in the making for decades. Presidents before Obama contributed to it's demise when they started printing money. However, President Obama and Congress are doing a great job of pushing the dollar over the edge. It is also interesting how other nations have done the same thing. This isn't just an American problem but a world-wide problem. I think this video will help you have a better understanding of how we got to this place and what to expect from the future. What do you think about the Whitehouse attempt to keep Fox News out of the pool for interviews? The Whitehouse is fighting back with force to anyone who does not agree with them or tow the line. Don’t they know the bounds of misusing the power of the President. I can’t believe this nerve it takes to attempt this type of move. This just adds to all the other areas of over-stepping the bounds by this president. I hope you can see what is going on here and start speaking out to let President Obama understand that we are watching and that we are not afraid to replace him and Congress if we need to. I think he thinks his crap doesn’t stink, and that my friends can be a huge problem in the future. Keep in mind that he has only been President for 10 months. What will we see in another 10 months is scary to me. We need people like you to keep the Whitehouse feet to the fire and make sure they know we are paying attention to them. People need to understand what the Democratic Party is trying to pass over on us. They are determined to pass a bill to save face. They MUST put out something that the President will sign and that they can sell to the people and Congress. We need to make sure we keep on the pressure and let Congress know we are watching. 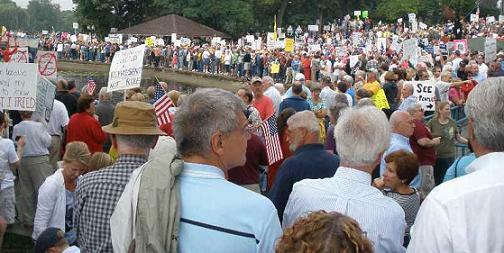 If they want to be elected back in 2010, they better start listening to the people. No one argues that we need health care reform, and no one will argue that people who have no insurance need to be able to resolve their problem equitably, but most Americans don't want a plan that is obviously not affordable. What would have been said if President Bush or a Republican Congress had tried to push something like this on Americans? You know exactly what would happen. So why is it different now? You know the answer to that too; because Congress and the President think they can do whatever they want and the people can't do anything about it. Are they right? Are they going to get away with ignoring the people? It's up to you to get this information out so people are made aware of what Congress and the President are trying to put over on us. Tell them they are wrong, that they cannot do this and get away with it without cost to them personally and professionally. I would really appreciate your comments on this subject. I want to know how you feel about all this being done behind closed doors as well. I need you to sign up as a member patriot and pass on the word. We have power as a group and so I need you. 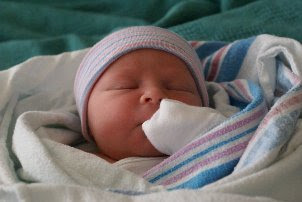 Grandson Dylan was born yesterday, October 16th, 2009. He is grandson number 9 and grandchild number 14. In December (if Christopher doesn't decide to come early) will be the arrival of grandson number 10 and grandchild number 15. Our families are the most precious treasure we have on this earth. They give us the desire to do things we may not normally want to do and they give us the joy of continuing our family name. Children gives us a reason to carry on in the face of hardship and trials. They are our legacy, and a representation of how well we prepared our children to face the world just as we had to do. Family is why we go to work every day when we don't really want to, and why we do things that others will not do. I can think of no greater joy on earth than to be a mother, a grandmother, an aunt, or a teacher of the little ones; watching them develop their personality and standing by their convictions. We must protect these priceless gems because they depend on us. They need us to protect their future and their freedom to live in the same America that we were raised in. Our legacy is what they will say about us when they think of what we did for them in protecting their freedom and their future world. What will they say about you? I know what they will say about me. I started a blog on patriotism to show you that even an unskilled writer like myself can find freedom from adversity and chaos with positive works such as blogs, books, poetry, or song. I hope that by doing this, I demonstrate how fulfilling it is to expose our passion to others. There are a variety of ways in which you might do something positive to show patriotism. I hope you will join me in this project that I've become part of by being more active in protecting our way of life. You can use your talents to ignite passion in others to express their gratitude for living in the United States of America. It is not important that the work we do shows greatness but that we release what is locked up inside us and turn it into something good and productive! It just might be that you will inspire someone or help them in ways that only we can. Unless you free yourself of restraints and reach out to the people around you, you will never know the joy you might bring to a person when you share your unique abilities. What is more, you will never know the joy that fills your soul until you do — and that would be most unfortunate! It is exciting to express your passion about things that are important to you, and it is satisfying to use your God-given talents in serving others. Free expression that is healthy and lawful inspires people and provides more quality to their existence and to yours as well. A certain energy is released from inside you that, when used properly, generates something positive, wonderful, and very uplifting. As this energy gathers momentum, it pushes you toward fulfilling your potential. Nothing else does this much for you, and it is the surest way I know to create greater peace within your soul. I believe that if we work together, we can create a much healthier society for all of us. I also believe that when we personally try to live by The Nine Principles listed by Glenn Beck (1. America is good. 2. I believe in God and He is the Center of my Life. 3. I must always try to be a more honest person than I was yesterday. 4. The family is sacred. My spouse and I are the ultimate authority, not the government. 5. If you break the law you pay the penalty. Justice is blind and no one is above it. 6. I have a right to life, liberty and pursuit of happiness, but there is no guarantee of equal results. 7. I work hard for what I have and I will share it with who I want to. Government cannot force me to be charitable. 8. It is not un-American for me to disagree with authority or to share my personal opinion. 9. The government works for me. I do not answer to them, they answer to me. ), we will all do better than we have done in the past. We can all do something more than we have in the past, but the problem is that many of us don't know we have a problem. We don't seem to recognize that our way of life is at risk of being stolen from us by legislators. We have to start paying attention to what is NOT being reported by the well-known media. Why are they not reporting this important information? Why do we have to go to elsewhere to find the answers? Why have you not asked yourselves these questions before I asked them? There is a lot that is not being reported, just go to my websites for more information (OurdaysReports.wordpress.com, FaceOfAmerica.wordpress.com, DemiseOfAmerica.wordpress.com). I hope you will commit yourself to the minimum and sign up to be a member. 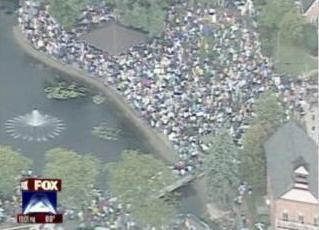 Watch this video of the September 2009 protest march on Washington. Note that there is not rioting, no fighting, and not garbage left on the streets. Please find below a special message from our sponsor, The Tea Party Express, a project of the Our Country Deserves Better Committee. They have important information to share with you. Thank you. OCT. 25 - NOV. 11 - And We Need You! If Barack Obama, Nancy Pelosi and Harry Reid thought we were done in our efforts to TAKE OUR COUNTRY BACK, they have another thing coming. 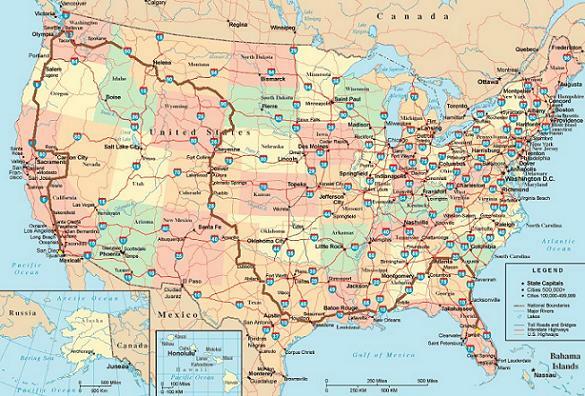 We're pleased to announce that the Tea Party Express is back - and rolling across America October 25th - November 11th. 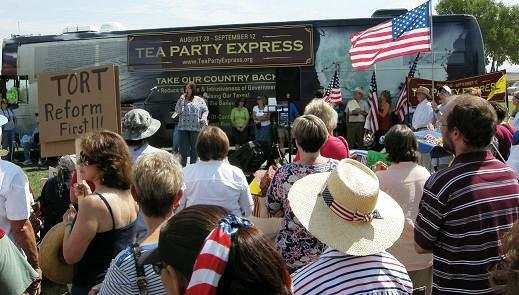 It's called the "Tea Party Express: Countdown to Judgment Day" and it marks the 1-year mark before the 2010 congressional elections. On this tour we will be launching the campaigns to defeat the Members of Congress who have been the worst offenders in supporting the leftist policies of Barack Obama, Nancy Pelosi and Harry Reid. In fact, Sen. Harry Reid (D-Nevada) is one of our top targets to defeat! We urgently need your support - time is short: we have less than 29 day to raise the funds needed to put this giant effort together! We are asking you to please make a contribution to our cause and our upcoming big project. You can contribute online - HERE. The maximum contribution allowed by law is $5,000 per adult individual. We're hoping at least 500 of you can make a contribution of $100 or more! If you liked what we did with the first Tea Party Express you're going to love what we have in store for our second effort. It's going to be even bigger and better yet! So please lend us your support. Whether you can afford $25, $50, $100, $500, $1,000, $2,500 or the maximum amount of $5,000 we really need your help! You can contribute online right now - HERE. SNAP SHOT OF THE PEACEFUL MARCH OF 75,000 TO WASHINGTON IN PROTEST OF TAXATION AND RUNAWAY SPENDING OUR CHILDREN WILL HAVE TO PAY FOR THE REST OF THEIR LIVES. NOTE THAT THERE WAS NO VIOLENCE, RIOTING AND DAMAGING OF PROPERTY, AND THAT THERE WAS NOT 2 - 3 FEET OF RUBBISH LEFT BEHIND. These protesters were men, women, and college students. They were made up of the working class, most of them have never been in a protest before. There were Democrats, Republicans, and Independents (their party affiliation was not the reason for protesting and neither was it an anti-Obama protest). These people were simply there to protest all the reckless spending coming out of Washington. Thank you again for your support. We've got a lot of work to do to take our country back, and we couldn't do it without you! This was an e-mail sent to me and is not unsolicited. I wanted to share this information with you because I hoped you would find it useful. If you do not currently subscribed to NewsMax.com and would like to, see the links below. If this e-mail has been forwarded to you and would like a subscription, please sign up here. We respect your right to privacy. View our policy.